Electromagnetic Drums that we manufacture, export and supply are widely in demand amongst buyers. Our Permanent Magnetic Drum Separators are essential in processing industry and are widely used for the separation of iron contamination from minerals, chemicals, food, flour, sugar, grains, plastics, sand, cement, fertilizers, rock, boring and many other gravity or conveyer transported product. 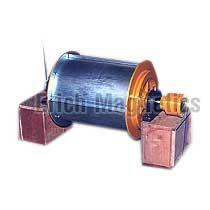 Buyers can obtain our Electromagnetic Drums at market leading rates from us. The Permanent Magnetic Drum Separators are available in standard drum diameters of 300mm, 400mm, 500mm, 650mm, 800mm and 1000mm. Drum width range from 300mm to 2000mm. Other sizes can be made as per customers requirement.